Representing peace, anarchy, and Dagda's mark. 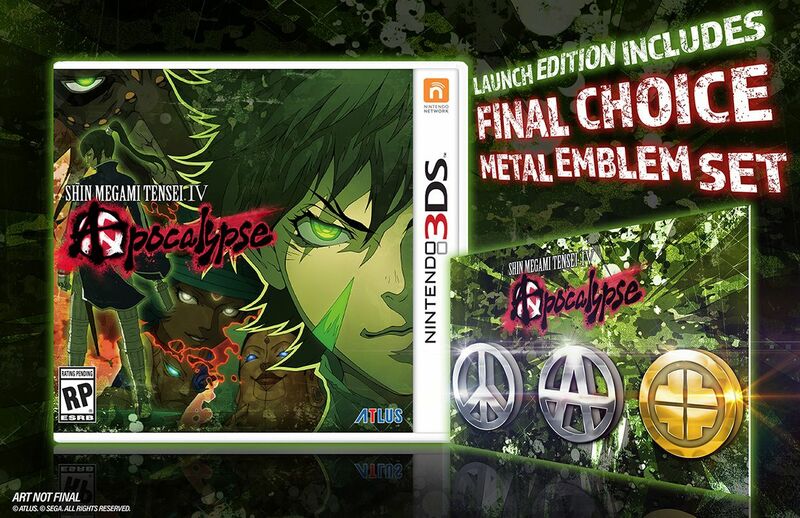 Pre-orders and launch day copies of Shin Megami Tensei IV: Apocalypse in the Americas will include a set of three metal emblem pins, Atlus announced. The emblems are roughly 0.75″ in diameter each and have a high shine finish. From left to right, they represent Peace, Anarchy, and Dagda’s mark. In the game, Dagda, the god who resurrects the protagonist, literally leaves his mark on the hero. Shin Megami Tensei IV: Apocalypse overlaps the story of the original Shin Megami Tensei IV and stars a Hunter cadet protagonist who gets killed by a demon in post-apocalyptic Tokyo. However, a god named Dagda resurrects him in exchange for his loyalty, and sets him on a path that treads a fine line between peace and anarchy. Shin Megami Tensei IV: Apocalypse is due out for 3DS in the Americas this summer. It will be available physically and digitally for $49.99 / CA$64.99.